Silver Spring, MD — TSC Advantage today announced it will hold a complimentary workshop on October 16, 2018 to educate individuals and businesses on how to avoid social engineering tactics used by hackers. “How Hackers Get You! Social Engineering Tactics and Ways to Combat Them” The free event is part of TSC Advantage’s multiple efforts in October to highlight the importance of improving cyber hygiene and resilience. As a third-year Champion of National Cybersecurity Awareness Month (NCSAM), TSC Advantage helps promote cybersecurity, online safety awareness and privacy protection. Held annually in October, NCSAM was created as a collaborative effort between government and industry to ensure all digital citizens have the resources needed to stay safer and more secure online while also protecting their personal information. TSC experts will publish articles and infographics on weekly themes, participate in NCSAM Twitter chats, host a complimentary workshop, and provide cybersecurity education to staff. 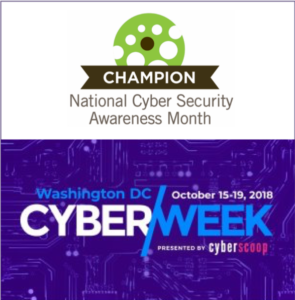 Additionally, TSC Advantage is a participant in DC CyberWeek, “the nation’s largest cybersecurity festival,” organized by CyberScoop. It features hundreds of community events hosted by top leaders in the cyber world. For the second year, a TSC Advantage workshop is on the official schedule. Attendees will learn how to recognize phishing attempts, see real examples of social engineering, and receive tips on how to close the door on cyber thieves. TSC Advantage is an innovative leader in enterprise risk assessments, cybersecurity consulting, and managed services. With its DHS SAFETY Act-designated methodology and Secure Halo assessment platform, TSC Advantage provides an objective understanding of security posture to help companies prioritize resources, reduce third-party cyber risk, and meet compliance challenges. TSC Advantage supports the public sector, as well as a wide array of industries across the Fortune 500, including healthcare, manufacturing, finance, critical infrastructure, and global insurance underwriting markets.